Sure enough, all year long but especially all summer long, the French serve little appetizers -- apéro -- of market-fresh radishes, small, magenta, a little spicy, but also much sweeter than the American version. They are served raw and cold, with a pat of butter, ideally lovely butter with salt crystals. Or they are served with unsalted batter, and then dipped into a bowl of large sea salt crystals there. You put a little butter on the radish and then the salt sticks to the radish. You can, if you want to be fancy, trim the radish and score it with an X so that the butter really sinks in, but it's not necessary and not always done, even by the French. The resulting snack is a fantastic combination of juicy, creamy, crunchy, salty, sweet, spicy. It's refreshing, as long as you can handle the zing of a radish. There's an absolutely torturous-looking video online, called Radishes and Butter: Doing Business with the French, produced by some cultural arm of the French Embassy in the US. It has existed, as far as I can tell, since the 1980s, yet has under 500 views and zero comments. I do not recommend the video, unless you are entertained by retro-kitsch, but I do recommend radishes and butter and salt as a snack or apéro, any time. 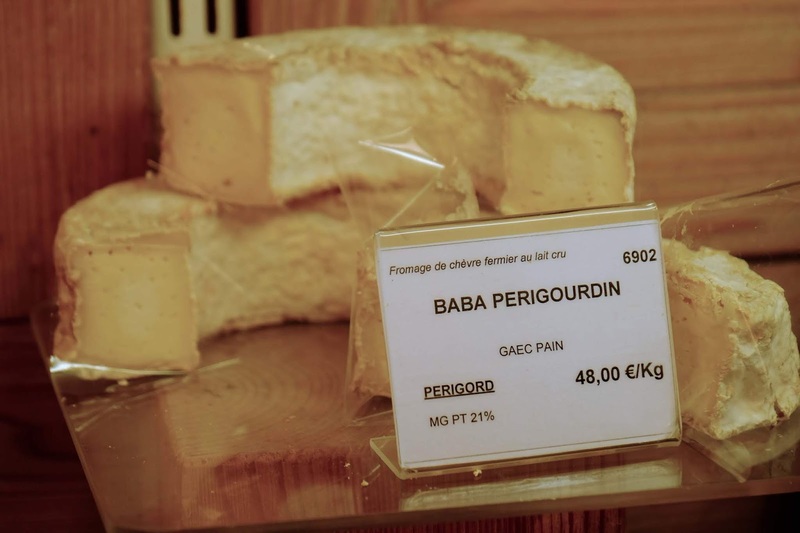 Baba Périgourdin is a raw goats' milk, farmhouse cheese made -- as the name suggests -- in the Périgord, which is the area historically (and still commonly) also known as the Dordogne, in the region officially now known as Nouvelle-Aquitaine. It's an amazingly-shaped, enormous ring of goat cheese. The hole in the ring is so big, it looks like it could house another entire ring-shaped goat cheese. It's not just the shape that's unusual; the taste is unusually strong, pungent, spicy, very salty, and high in umami earthiness. The texture is that absolutely silky, oozy, wet, nearly-melted goop that makes my heart sing. But the kick is so strong that I could say it has a hint of ammonia -- so strong that it doesn't get immediately wolfed down from the cheese party. This isn't to say that I don't enjoy or like the cheese, but it's got a harsh zing to it that not many of my cheese-eating friends find it so pleasant. Therefore -- unusually -- there are leftovers of this oozy goat cheese. This particular cheese party is held with good friends on the quay by the Seine, and by the time I unload the cheese from the bag back at home, it's pretty mangled. The word "baba" can be slang for "hippie" but, in this case, probably refers to the ring shape. It brings to mind a baba au rhum, a sort of rum-cake dessert in which the cake has a raised ring around it, which holds in the toppings. It's a highly unusual cheese, and one that I've only seen -- so far -- at Laurent Dubois cheese shops in Paris, though I assume I could also find it in the Périgord, at the very least. I wanted a cheese that was both buttery -- like butter (check). And also a little salty and bitter -- like radishes and salt (check). Baba Périgourdin fits the bill and, in this way, represents the radish/butter/salt flavor combination.